California's form of government is not adaptable to California's present size. In 1879 the size of the legislature was capped a 40 Senators and 80 Assembly members. Where once each Senator represented 22,000 Citizens, they now represent over 936,000people. Our vote has been diluted to over 42:1. Now we suffer from lack of representation and dilution of vote. California has the highest maximum personal income tax rate at 13.3% and the highest sales tax rate of 7.5% before local sales taxes are added. On top of that, corporations have to pay 8.9% in income taxes. We have been disenfranchised! Every day the California legislature creates laws that strangle our economies and drive out businesses and our families to other business-friendly states. Rural industries such as timber, mining, fishing and agriculture are a diminishing force. Article 4, Section 3 of the US Constitution states, "New States may be admitted by the Congress into this Union; but no new State shall be formed or erected within the jurisdiction of any other State; nor any State be formed by the junction of two or more States, or Parts of States without the Consent of the Legislatures of the States concerned as well as the Congress." Article 2, Section 1 of the California Constitution states: "All political power is inherent in the people. Government is instituted for their protection, security and benefit, and they have the right ti alter or reform it when the public good may require." Part of a formal separation includes absorbing our proportional share of the current state debt. A financial analysis was performed using the actual 2016/2017 budgets from 23 northern counties to show needed expenditures. The model at SoJ51.org/Finances.html shows an aggregate county surplus without reducing the current expenditure. Schools, roads public safety and infrastructure are all accounted for. Article 4 of the US Constitution provides for the creation of new states. We the people intend to create a new state that would exercise its rights under the 9th and 10th Amendments to halt the Federal government from overreaching laws according to the US Constitution. Our goal is to return to common sense government, redirect balanced representation, and reclaim our Liberty, Freedom and Property Rights. It is our responsibility to reform our government and restore our liberties and our freedoms. We need a state with fewer agencies (California has over 570!) lower taxes, less bureaucracy, state sovereignty and personal freedom. The State of Jefferson is the Answer! In 1941 the residents of southern Oregon and northern California-fed up with paying taxes and receiving no services in return-decided to form a new state. A gold pan was handy, they painted two X's on it (representing the infamous double cross) and the State of Jefferson was born. We the People of Northern California have, essentially, no representation. 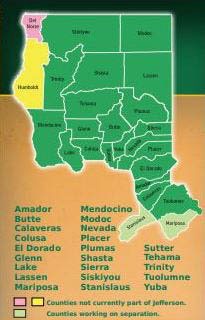 111 Southern State Representatives impose regulations on Northern rural California counties. Our 9 elected Northern California Representatives have little or no voice; laws that benefit southern cities and counties do not reflect the values and needs of the orht state's residents. We are out voted 111:9! From these regulations and restrictions, many of the northern counties have been impoverished through loss of industry, jobs, and the addition of higher taxes and regulations. We Suffer! Northern California has no chance of proper representation under the current governmental structure. Urban voters make decisions that adversely affect rural areas, whether intentional or not. Our votes will never county due to this legislation by Mob Rule! We the People of the northern 23 counties have an obligation to reject California's over-taxed, heavily-regulated mandates. We the People need to start over!